I did several searches but couldn't find anything that helped. I am in the process of getting tuned and switching over to TephraMod V7 (94170715-v7). I am using the Omni 4 Bar MAP Sensor to log boost, and the Grimmspeed 3 Port for ECU boost control. The problem that I am having is getting EvoScan v2.7 to log boost. I get a constant 36.7704 psi as a boost value in EvoScan. My tuner has no idea why this is happening. I have attached a picture showing how I have the Omni 4 Bar set up in EvoScan. Most of my driving is at 500 to 700 feet above sea level, so I am using 14.4 in the formula. Does anyone see a problem with the way it is set up, or have any idea why I can't log boost? Maybe start with the simple things. Is the MAP sensor connected to the correct port on the ECU? Are the wires good (no breaks)? Thanks, all that is good. The Omni sensor is plug and play, just plugs into the same connector that the stock sensor plugs into. Would it matter what version of EcuFlash I used to flash the ROM? I use EcuFlash v1.32 becuase the higher versions don't seem to want to work with my laptop. Last edited by drb; Aug 3, 2011 at 11:36 AM. Your best bet would be to check the voltage on the respective pin when the ignition is turned on and see whether the voltage corresponds to your local atmospheric pressure. This way you'll know if the problem is mechanical or software based. With this information it would be much easier to solve the situation. did you follow all the steps on the how to in this forum? i just did mine about a month ago and i got it working the first time after following the step by step. I didn't really need to follow all the steps (I don't think). Let me know if I'm wrong. 1. I installed the the Omni 4 Bar MAP Sensor - plugs right in to the same connector that was used by the stock sensor. 2. 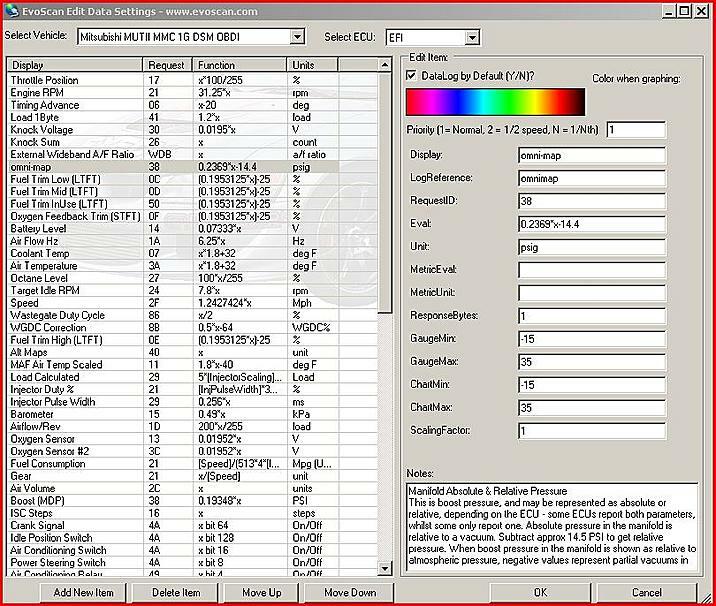 My tuner supplied me with an xml file for the Tephra V7 that he is using on the tune. 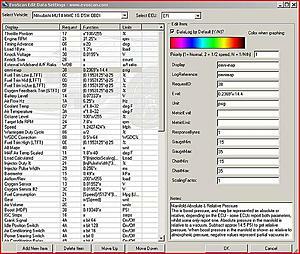 I put the xml file in the ECUFlash rometadata folder for the evo. 3. I changed the data in EvoScan as shown in my original post above. Last edited by drb; Aug 3, 2011 at 11:23 AM. I'm not sure that I follow you. Do you mean to check the voltage on pin #81 to be sure that it is 5 volts? Has he messed with the MUT table in the rom he sent you? All the evoscan info looks correct. The person may have given you the correct XML data to display the MAP sensor data that needs to be edited in ecuflash... can you post up the MAP sensor data from ecuflash? click edit on your map sensor in evoscan and make sure you entered all the necessary info. make sure you entered the correct formula for your altitude. are you sure your tuner downloaded the correct xml to upload. maybe he didn't even make the proper changes in the xml or something. this is why i do stuff myself. I mean to check the voltage on the pin #73 in your case (pin # are different for VII and IX) and see whether the signal wire voltage corresponds to the voltage that should be observed under your local atmospheric pressure (just to make it clear - you need to know the voltage that goes to the ECU through that wire). Should be done with ignition turned on, but the car not running. It takes 3mins if you have necessary equipment and gives you clear understanding of the nature of the problem. If it will show something a bit lower than 1.168V - your sensor and wiring is ok and you should check the software, if the reading is way off from the above mentioned value - either wiring is damaged or sensor is not working. It is that easy and much more efficient than online brainstorming without sufficient input data. Last edited by vd; Aug 4, 2011 at 02:09 AM. Thanks, I will check the voltage. My tuner connected to my computer remotely today and pretty much ruled out software issues. I have tried 2 brand new Omni MAP Sensors and had the same problem with both. It looks like the wiring, harness, or connections to the ECU might be the problem. so what's that tell me? Last edited by drb; Aug 6, 2011 at 10:07 PM.